The discovery method has been further improved. Furthermore, it does automatically retry discovery. 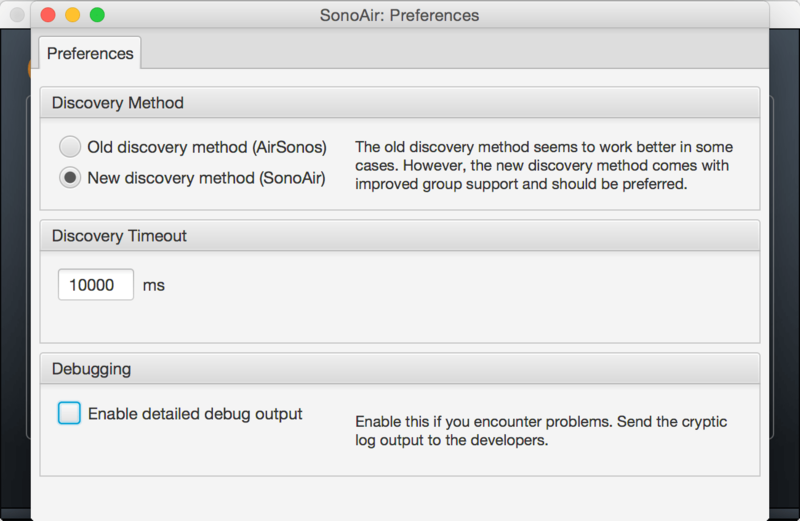 35 Responses to "SonoAir v1.0 (Beta 4.0)"
mac os x 10.10.4, every thing works fine, new discovery method detects all devices (2xplay:5, play:1, connect) I can use the settings for LED and loudness (while I prefer using the sonos-app). if anything in the environment changes like additional sonos device, it seems to be useful to stop sonosair and sign off and on again. Since my update to El Capitan (10.11), does SonoAir not work anymore. It can found my devices, but there will not be displayed on the audio settings so I can not play sound over there. For test, I try to control the led from the devices and that works perfectly. If you need anything, just reply I will subscribe the comments. Yes, it’s in a half-public restricted beta. Same to me with El Capitan. Same with me. It’s seems strange since the Airplay protocol hasn’t changed as far as I can tell with El Capitan. Hope we can get it working again with an Update? Any chance that is possible? Sorry Beta 4 is still not working propperly. New discovery methode ist not working and old methode is onky working sometimes and speaker options doesnt work. Best functional Version ist 3.1 – perfect, quick so why do you develop the wrong way? Is there anything limiting this to Mac? If it’s Java based is it viable that it could be compiled to run under Windows or Linux? The UI works on Linux, Mac and Windows. Same for the Java Sonos API. But the airsonos module has to be compiled for each OS since it contains&uses native libs. Currently, I don’t have the time to do all the testing on all three platforms. And most users seem to use AirPlay on OS X.
Hello! I have Mac OS X Yosemite (10.10.4) and tried to connect SonoAir with Sonos Play 1. Unfortunately, the app searches for devices since forever… Do you have any advice? Did you try to change the discovery method in the preferences? just wanted to thank you for this. I’m on Yosemite and, after a frustrating afternoon unsuccessfully trying to install airsonos (problem with node-gyp rebuild) I happened to come across your packaged solution. Downloaded it, started it up, and it worked instantly! One Question: is there any way to “group” the airplay outputs like the native Sonos app can? Does anyone know how to update the embedded version of airsonos? Looks like the version in 1.0 Beta (40) per the changelog is 0.1.1. From Stephen’s GitHUB looks like current is 0.2.2 (https://github.com/stephen/airsonos/blob/master/CHANGELOG.md). Couldn’t be as easy as swapping out nodes librabry /Applications/SonoAir/SonoAir.app/Contents/Java/resources/osx/node-v0.10.28-darwin-x64/lib/node_modules/airsonos Could it? The original version was unmaintained for quite some time. Here is my fork of airsonos: https://github.com/miho/airsonos It shouldn’t be difficult to merge them again. I plan to switch to the original since it seems to be actively maintained again. Anyone trying to use SonoAir v1.0 (Beta 4.0) and AirServer (www.airserver.com). According to the original author (Stephen) his reference implementation of the node.js code in airsonos should work fine on the hosted on the same machine. "Do other AirPlay (AirPort Express, AppleTV) devices show up? Unfortunately SonoAir will not reliable work with AirServer 5.3.2, Any suggestions (other than quitting AirServer so I can use SonoAir,)? I have a mini in my Home Entertainment center that I want to transcode to Sonos AMP (powering speakers in dining room), while the mini is connected to the speakers in the living room. Both don’t need to be active at the same time though I did for a short while mange to get both apps and speakers active. FYI I have no Sonos product in the living room just the AMP that powers the living room. Has anyone experienced a delay when using SonoAir to Airplay to Sonos Speakers? kannst Du absehen ob und wann Unterstützung für macOS >=10.11 und IOS 9 / 10 kommen? kann man Dich irgendwie zusätzlich unterstützen? Ich habe Kontakt zu einigen, die gern iTunes mit Sonos Lautsprechern kombinieren würden…über Dein SonoAir! Auch ich würde Dich gern unterstützen, wie Matthias 😉 Gibts da eine Möglichkeit? Hallo Bella, vielen Dank! Mein Problem ist, dass ich nicht die komplette Hardwarepalette von Sonos habe. Dadurch gestaltet sich das Auffinden von Fehlern recht schwierig. Vielleicht habe ich ja irgendwann genug Einnahmen zusammen, um neue Sonos-Geräte zu kaufen. Hallo Matthias, es gibt eine neue Version. Vielleicht löst sie das eine oder andere Problem. nutze Beta4, bekomme den Sonos Lautsprecher in iTunes angezeigt, kann aber nicht verbinden (Unbekannter Fehler -15000). Der Tip mit dem Verbinden über die Menüleiste funktioniert nicht, weil da der Sonos Lautsprecher nicht angezeigt wird. Ich bin auf El Capitan 10.11.6. Irgendeine Idee?